Black sage grows off the hook here my hood! Fields of it. I find it all over the foothills ringing Los Angeles. It’s a woody evergreen shrub that grows about three feet tall. 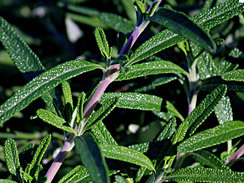 Its dark green leaves are long and slender, an elongated oval shape 1-3″ long. Volatile oils make the leaves ever-so-slightly sticky to touch. It likes sun, tolerates some shade. 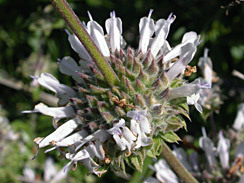 Its flowers are a distinctive marker for this plant. The small flowers jut out from round ball formations arranged in a row vertically upward along the stem’s top end. Near Los Angeles, I find the flowers are purple or lavender, though they can also be white. The flower balls are green during rainy growing season. 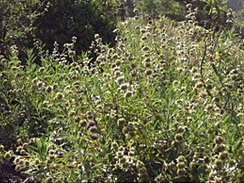 They turn dark brown and lose their flowers during and after the dry season.